A moderately suckering variety that reaches 10′ in height at maturity. Produces 13mm even ripening berries that have a well-balanced, tangy taste. Fruit holds flavour better than other cultivars. Zone 3. A heavy producer of large fruits. Produces 16mm, sweet, juicy berries that ripen later than Smoky. Reaches 8′ at maturity. Zone 3. A low suckering, early bearing variety. Reaches 8-10′ in height at maturity and produces a fullflavoured, tart 15mm fruit. Zone 3. An upright, slow spreading, 10′ bush. Produces few-seeded, intense flavoured, 14mm berries. Zone 3. A vigorous, productive variety that reaches 6-8′ at maturity. Produces large, firm 16mm fruit with exceptional taste. Zone 3. An early blooming variety that reaches 10′. A large-fruited selection, with excellent flavour and uniform ripening. Zone 3. A moderate suckering, late blooming variety. Has a compact size, reaching 5′ in height. 13mm berries have few seeds and good tangy flavour. Zone 3. A free suckering, early bearing variety that reaches 6-8′ at maturity. Heavy producer of large, 16mm berries that have an excellent sweet taste. Zone 3. A moderate to sparse suckering variety that reaches 12′ at maturity. 14mm fruit has an excellent,full, tangy flavour, that is fairly sweet. Zone 3. A vigorous, upright, 10′ variety. A low suckering plant that produces 14mm, sweet, flavourful fruit. Zone 3. The most popular Saskatoon variety and the full-flavour standard against which other cultivars are judged. 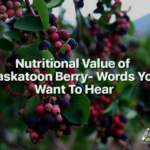 A prolific producer of large 14mm sweet saskatoon berries for sale that have the highest sugar/acid ratio. Reaches 8′ at maturity. Zone 3. A 6-8′ shrub that is moderately suckering. Produces 14 mm, slow ripening fruit with mild, somewhat apple-like flavour. Zone 3. A vigorous, moderately suckering variety. A large, 15′ shrub that produces the largest berries of all varieties. 17mm berries are pleasant and full-flavoured. Zone 3.